Disabilities Law Program - Community Legal Aid Society, Inc. The Disabilities Law Program (“DLP”) is a special project of Community Legal Aid Society, Inc., which is designated by the Governor as the Protection and Advocacy agency in Delaware. The DLP provides advocacy services to Delaware residents with physical or mental disabilities. We prioritize our services based on federal agency guidance and needs identified by consumer and community groups. Individual Advocacy -including investigation, mediation, negotiation, legal consultation and legal representation. Systemic Advocacy -emphasizing major reform efforts on critical issues affecting client groups through negotiation, legislation, regulatory work, and litigation. General Information – regarding available services, rights and remedies to clients and their families, service providers, attorneys and other representatives. Referral Services – provided to those who may be better served by other sources such as state, local or federal agencies, or other advocacy organizations. Community Education/Self Advocacy Training – community education materials and programs are provided as well as training and legal information workshops. The Disabilities Law Program includes seven advocacy programs serving individuals with disabilities. Qualifications for each program are described in detail below. PADD serves individuals with a severe mental or physical impairment that developed before age 22 which causes multiple major functional limitations that are expected to last indefinitely. The program also serves young children from birth to age 5 with developmental disabilities, or with conditions that may lead to developmental disabilities without services. PAAT serves individuals with disabilities experiencing legal barriers to access to assistive technology devices and services. Assistive technology includes durable medical equipment, wheelchairs, communication devices, and other disability-related aids. Individuals of all ages with significant disabilities are eligible for services under PAAT. other services directly related to disability and assistive technology. PAIR serves individuals with a severe physical or mental disability that is not considered developmental, or that occurred after the age of 22. Other rights related to the disability. Reside in the community but are at risk of abuse, neglect or civil rights violation. If you suspect that your child may need special education services in school, you should submit a written request for a special education evaluation to your child’s school. Click here for a sample special education evaluation request form. Correction of defects in vocational rehabilitation, employment and support agencies. 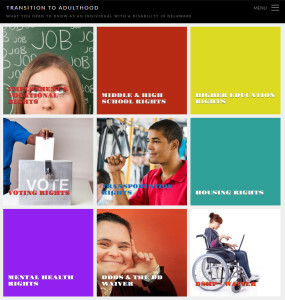 For more information about employment and vocation rights of youth who are in transition to adulthood, visit the DLP’s Transition to Adulthood site. PATBI serves individuals with traumatic brain injury, an injury to the head caused by blunt, penetrating, or other force which generally results in mental or physical dysfunction. PAVA serves individuals with disabilities to ensure full and effective participation in the electoral process. PAVA typically advocates to overcome policy and physical barriers to voter registration and to access polling sites and usable voting equipment. Typical advocacy includes training, technical assistance, and legal representation. However, Federal guidelines disallow project funds to be used for litigation involving disability-related election access. The national Protection and Advocacy (P&A) system was initially established through federal legislation in response to the abuse, neglect and lack of programming in institutions for persons with disabilities. Since 1975 Congress has created several distinct statutory programs to address the needs of different populations of persons with disabilities. The governor in each state selected an agency to be the P&A system. Community Legal Aid Society, Inc. (CLASI) was designated to be Delaware’s P&A system, and provides legal advocacy services through its Disabilities Law Program. Since 1977 the Disabilities Law Program has grown to include its current seven specialized programs. If you suspect that your child may need special education services in school, you should submit a written request for a special education evaluation to your child’s school. Click here for a sample special education evaluation request form.